The users you invite to collaborate need to upload, open, and edit files, but should they delete or share the content with others? Choosing the right collaborator permissions can save your data from deletion and other scares. 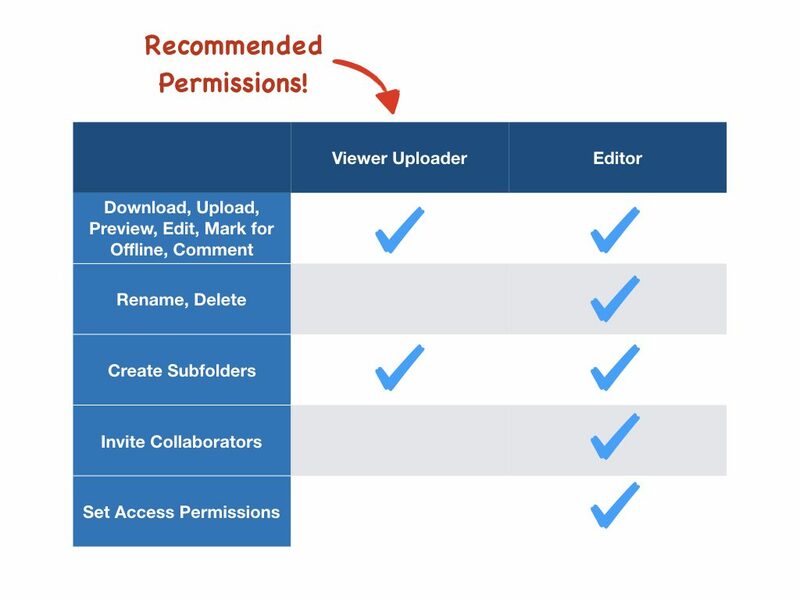 Viewer Uploader permissions provide most functions collaborators need. Our recommended permission level for most folder collaborations is Viewer Uploader. See the table above for some ways Viewer Uploader differs from Editor permissions. When collaborating on a file directly, as opposed to a folder, the only permission level available is Editor. See Box Community: Inviting Collaborators to learn more about adding collaborators to your project or unit folders in Box. For the full table of permission levels and the actions they can perform, see Box Community: Understanding Collaborator Permission Levels.